While pancakes serve as a tasty addition to any family breakfast, they have a tendency to stick during cooking. Not only does this make it difficult to flip your pancakes but a stuck pancake can easily break, leaving a gooey mess in your pan and all over your spatula. The residue a stuck pancake leaves in the bottom of your pan also increases the likelihood of subsequent pancakes sticking, giving you no choice but to scrub the pan before cooking the next pancake. You can avoid the frustration of stuck pancakes and a ruined breakfast by taking precautions to ensure that each pancake you make slides easily from the pan to your plate. Get out a nonstick frying pan. Nonstick pans boast a special coating that helps prevent food from sticking to the pan during cooking. Rinse and dry your frying pan before getting started. Even if you previously washed the pan, remaining food residue that you cannot see can and will make your pancakes stick. Dip a paper towel in vegetable or canola oil and wipe the bottom and sides of the pan with the dampened paper towel until the pan has a light sheen of oil. Place the pan on the stove and set the burner to "Medium-High." Test the pan after several minutes to ensure that it's hot enough by wetting your hand and flinging several drops of water onto the pan’s surface. In a properly heated pan, the drops of water will bead up and sizzle before disappearing. A hot pan slightly sears the outside of each pancake, preventing the batter from sticking to the pan. Drop a small spoonful of butter into the pan. This provides your pancakes with a rich, buttery flavor while simultaneously lubricating the pancakes and preventing them from sticking to the pan. Allow the butter to melt completely. Pour the pancake batter into the pan until your pancake reaches the desired size. Cook the pancake. The amount of butter you will need will vary significantly depending on the size of the pan. The larger your pan, the more butter you will need. Heavy pans work better for cooking pancakes that don’t stick. 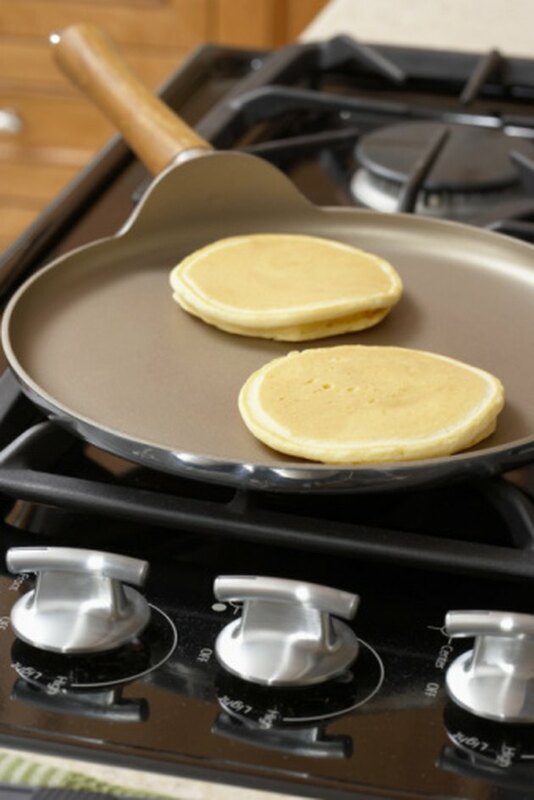 Thin pans can heat unevenly, causing pancakes to stick to their surfaces even if they have a nonstick coating. Pancakes soak up butter while they cook. If you plan on making a large batch of pancakes, periodically melt more butter. You can substitute cooking spray for the butter. Wait until the pancake's edges begin to bubble before turning it. Bubbling edges signify that the bottom of the pancake has solidified. Turning the pancake too early not only makes a mess but increases the risk that your pancake will stick to the pan. Do not use metal implements on your nonstick pan to avoid scratching the coating, which can result in food sticking to the scratched area. EDInformatics: Why Does Food Stick to Stainless Steel Surfaces?